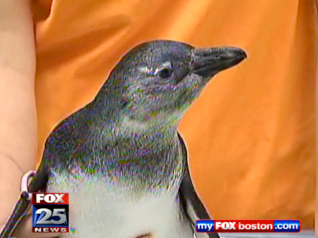 One of our eleven penguin chicks had a very important solo in the spotlight this morning. Andrea accompanied this youngsters during a live appearance on Fox 25. She answered questions about African penguins and talked about our exciting Penguin Naming Contest. Our penguin just stood there looking very cute. Take a look! If you're planning to submit a name for the contest, you have until this Sunday, 8/22. Remember, we're looking for educational and conservation-themed names. Just click through to this submission form to throw your entry into the hat. Our biologists will be choosing one name and a winner will get a behind-the-scenes tour of the Aquarium!